Bird strikes are perhaps the greatest unappreciated risk pilots face. There are a number of reasons for this, but among the primary contenders is the fact that most strikes result in expensive airframe and powerplant repairs rather than catastrophic conclusions. There was some attention paid to this important topic after some geese put US Airways Flight 1549 down in the Hudson River, but with no loss of life, that attention quickly faded. The the threat remains, and it’s growing larger. A joint report from the FAA and US Department of Agriculture’s Wildlife Services, Wildlife Strikes to Civil Aircraft in the United States 1990-2013, notes that the number of reported strikes has increased more than six-fold, from 1,851 in 1990 to a record 11,315 in 2013. Birds accounted for 97 percent of them. The number of US airports where strikes occurred also increased over the same period, from 331 to 649. Look at almost any airport listed in the Airport/Facility Directory, and its remarks will probably note: “Birds on and invof arpt.” No pilot would accept a weather report this vague, so why do they accept it for wildlife? And why is a pilot’s education lacking in wildlife knowledge? Do you know when and at what altitude most bird strikes occur? The US Air Force is the long-time leader in BASH, Birds/wildlife Aircraft Strike Hazard, research and solutions. Since 1995 it has suffered 69,000 strikes that killed 23 aviators, destroyed 12 aircraft, and caused more than $400 million worth of equipment damage. 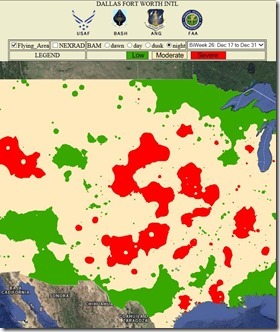 To help avoid adding to these numbers it created the Avian Hazard Advisory System (AHAS) and a bird avoidance model that melds Geographic Information System (GIS) technology with bird habitat, migration, and breeding characteristics, combined with key environmental, and man-made geospatial data. PS: Most bird strikes occur at 3,000 feet AGL or lower, with strikes more likely an hour before and after sunrise and sunset, when the birds are moving from their nests to their feeding areas. This entry was posted on Monday, November 24th, 2014 at 12:33 am	and is filed under Airports, FAA, Flight Training, General, general aviation. You can follow any responses to this entry through the RSS 2.0 feed. Both comments and pings are currently closed.